How many recipe’s do i need to craft to gain Tea House level? 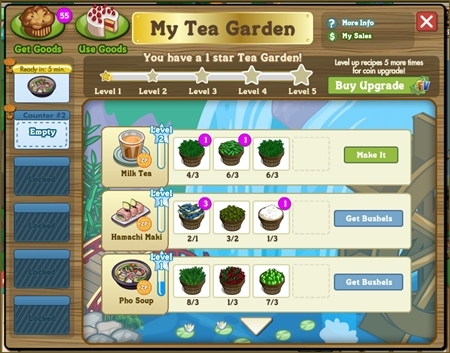 You can see how many recipe’s you still need to level up to gain Tea House level at the top right side of the Tea House Menu. How many times do i need to craft a recipe in order to level it up? You can check how many more you need to make by hovering the mouse pointer in the “Star” icon beside it’s picture. I can not get jade falls to open. how do I open it. How can I plant, harvest or get the dragon sparklers?